The first U.S. installation of Martin Professional’s new VC-GridLED video module occurred on NBA TV’s new set at Turner Studios in Atlanta. 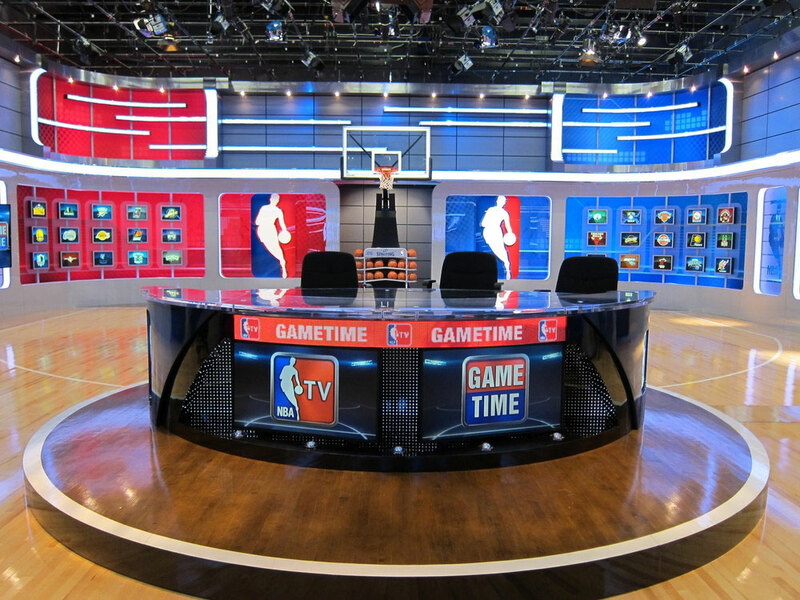 Innovative Show Design (ISD) designed a bi-level, 360º studio to accommodate the multipurpose needs of NBA TV and incorporated Martin’s new color-changing LED grids into the front of the set’s main anchor desk. The studio design encompasses two sides with each side split into multiple sections. An NBA regulated half court with 3-point line and goal are also a part of the set. The reveal of the new studio took place for the first game of the 2012-13 NBA season. The dimples of a basketball were the inspiration for using the 25 mm pixel pitch module, Justin says, with the VC-Grid’s small size and low weight also important factors. The module’s compact 200 x 200 mm size makes it extremely suitable for integration into set elements like the NBA TV studio. The LED module’s combined power/data cable allows VC-Grids to be daisy-chained for easier setup and less cabling and was another feature that Justin found valuable, along with the module’s excellent color rendering and high refresh rate for flicker-free looks on camera. Manipulation of the VC-Grids is through Martin’s award-winning P3 System Controller™ via a Martin P3 PowerPort 1500™ integrated power and data processor. Driven by the P3 Controller, the PowerPort 1500 powers the Grids with high-quality image processing and provides for extremely easy setup and configuration. The PowerPort can be placed up to 165 feet from the VC-Grids and in the NBA TV studio are located approximately 100 feet from the anchor desk. The VC-Grid was brought to ISD’s attention through Martin and lighting vendor CYM Lighting. Lighting dealer was CYM Lighting of Thousand Palms, California.